I must share how glad I am for having attended Advocacy Day last Saturday, April 13th. Thank you, WATESOL, for having chosen such important topics for us to reflect upon. There were two incredibly interesting presentations on two very controversial topics in the field: supporting undocumented learners and creating LGBTQ+ inclusive classes. In the morning talk, Lori Dodson, Sandra Duval, and Anne Marie Foerster Luu shared some data from the American Immigration Council (2017) and stated that there are currently 11 million undocumented immigrants in the US. The data urges us, language teachers, to take action and support undocumented learners so they feel welcome and not threatened, especially in these anti-immigration times. In addition, the presenters highlighted that what we already know can certainly help us understand our learners’ viewpoints. However, we welcome students’ stories with our own cultural lens and those may lead to biased interpretations. Then, there will be times we need to step back and let students teach us about their own realities. By listening to their stories and experiences, we become their allies and should start thinking critically about our role in this scenario. When teachers are students’ allies, they become culturally-responsive practitioners, whose aim is providing opportunities that will enhance students’ lives. In the afternoon talk, Joshua Paiz let the audience share how we usually feel when dealing with LGBTQ+ issues in language classes. As most of us shared unfamiliarity or fear of “getting it wrong”, he provided us with some application activities that can certainly generate insightful student-driven discussions regarding some of the situations and challenges the LGBTQ+ community face. Also, we learned queer inquiry-based pedagogies can best address the complexities embedded in such topics because they lead to students’ critical thinking. An inquiry approach requires LGBTQ+ outsiders (I prefer the word ally) and members to question social behaviors that negatively affect the LGBTQ+ community. Consequently, LGBTQ+ learners will feel acknowledged and may find the school community a safe space to open up about how they feel. However, we must respect an LGBTQ+ student’s decision not to be vocal in critical situations. Teachers will not make a difference by dictating how LGBTQ+ learners should act/react. Instead, they should show LGBTQ+ learners respect and support, so the school community awareness is raised. As an MA TESOL student who will graduate next month, I believe Advocacy Day was the perfect professional development event to finish this “graduate school” cycle in my life. I may leave the MA TESOL Program at AU a little bit overwhelmed by the career paths I may take so we have a more equitable TESOL world and by the number of things that must be done so we get there. However, I also leave the program excited and determine to help learners (and their communities) improve their lives. 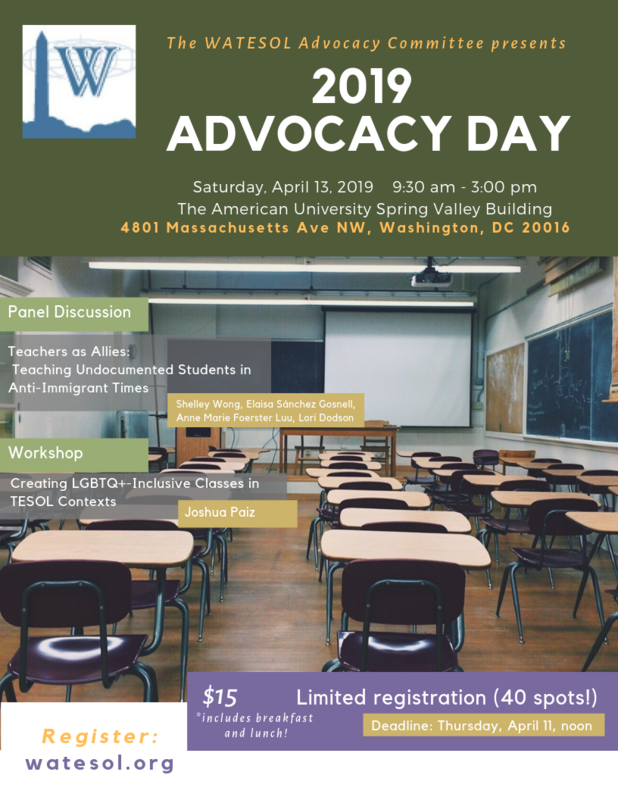 Join us for a special Advocacy Day PD event, sponsored by WATESOL's Advocacy Committee. Take a detailed look at the Advocacy Day Program. Breakfast and lunch are included! Space is limited to 40 participants. Register early!